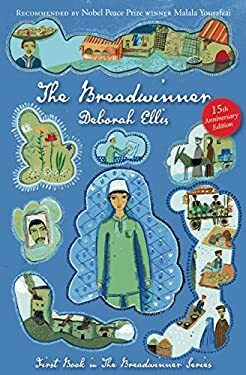 "All girls [should read] The Breadwinner by Deborah Ellis." -- Malala Yousafzai, New York Times The first book in Deborah Ellis's riveting Breadwinner series is an award-winning novel about loyalty, survival, families and friendship under extraordinary circumstances during the Taliban's rule in Afghanistan. Eleven-year-old Parvana lives with her family in one room of a bombed-out apartment building in Kabul, Afghanistan's capital city. Parvana's father -- a history teacher until his school was bombed and his health destroyed -- works from a blanket on the ground in the marketplace, reading letters for people who cannot read or write. One day, he is arrested for the crime of having a foreign education, and the family is left without someone who can earn money or even shop for food. As conditions for the family grow desperate, only one solution emerges. Forbidden to earn money as a girl, Parvana must transform herself into a boy, and become the breadwinner. The fifteenth anniversary edition includes a special foreword by Deborah Ellis as well as a new map, an updated author's note and a glossary to provide young readers with background and context. All royalties from the sale of this book will go to Canadian Women for Women in Afghanistan. Parvana's Fund supports education projects for Afghan women and children. New (1676 available) BRAND NEW. Over 1.5 million happy customers. 100% money-back guarantee. Make your purchase count: support Better World Books' worldwide literacy partners.